Would you like to stay in Wilderness, close to the beach in a homely, friendly accommodation? Then Inn2Wilderness Guesthouse is your top choice! Enjoy your stay in this breathtaking part of the Garden Route! We offer you 6 comfortable and well appointed guest rooms. Each guest room has its own private entrance, ensuite bathroom (with shower) and wooden veranda or patio. We regret our Guesthouse is not suitable for children under the age of 12. Start your day with a hearty breakfast that is served on the terrace or in our cozy lounge. Relax by the pool in our beautiful garden and listen to the birds, watch the magnificent sunset and listen to the sound of the waves from the Indian Ocean nearby. And the best thing of all: the beach is only a few minutes away! Enjoy the homely atmosphere on this beautiful piece of heaven on earth! Should you have any questions or if we can assist you with planning your holiday, don’t hesitate to contact us. We speak German and English. 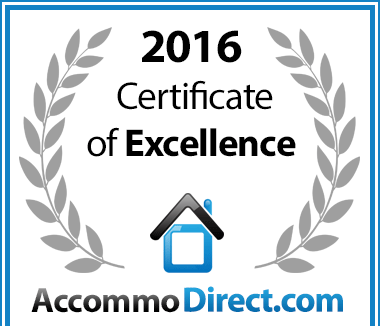 In recognition of exceptional service Inn 2 Wilderness Bed and Breakfast in Wilderness, Garden Route is hereby awarded a Certificate of Excellence.